I went to Napa a few months ago and dropped $500. In a day. Not on insanely rare wines or dinner at try-before-you-die restaurants, either. Nah, half a G bought me a hamburger, a smattering of wine tastings, and a night at the Holiday Inn Express. That's not to disparage Napa Valley (or the Holiday Inn Express). Lovely place, that Napa, full of wonderful people and terrific wines. It just may not be your idea of a $500-a-day good time. Trouble with Napa is, for a huge number of Americans, it's just so handy, relatively speaking. Anyone who's spent a week in Argentina will talk your ear off about how you can do Mendoza for, like, 87 cents a day, steak dinners and all. But reaching South America takes a full-blown getaway. So how does an American drink great wines amid breathtaking natural beauty without blowing out a couple of credit cards? Easy: go to Canada. And, no, you won't have to bundle up like the kids from South Park just for a flute of ice wine, though Canada stays open in March, so totally your call. 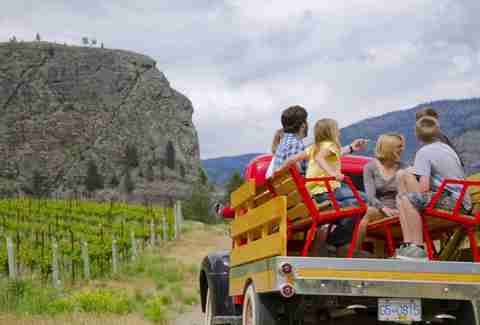 Instead, consider a summer or autumn jaunt to the Oliver Osoyoos wine region in British Columbia's Okanagan Valley. Obscure? Compared to Napa, sure. But it's also possibly the most scenic wine region in North America, and a place where normal people can afford to taste wine like royalty. Who is this Oliver Osoyoos person? The villain in a pulp spy novel, probably. The region is named for two towns there: Oliver (itself named for long-ago British Columbia Premier John Oliver) and Osoyoos (which shares a name with a local First Nations people; they pronounce it "oo-SUE-yooze"). Together the towns boast 39 wineries that crawl from the lush valley into the semi-arid mountains that surround the area. Wine tasting here is as much about the surroundings as the wine itself. The Okanagan Valley, wedged between the Cascades and the Columbia Mountains, enjoys hot summers and mild winters unique to Canada -- it constitutes the country's only temperate desert region. 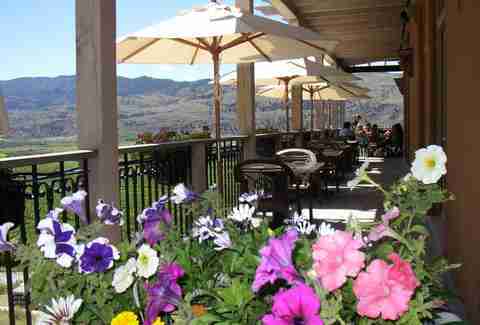 The wineries sit on the eastern and western foothills of the mountains, allowing you to enjoy the morning sun on the patio at Road 13 as you look east. To end the day, there's a sunset tasting over the valley at Burrowing Owl as you take in the westerly view. All of it overlooking the 12-mile-long Osoyoos Lake, which stretches down across the Washington border about halfway between Seattle and Idaho. So what will you be tasting? Definitely not ice wine. Asking a BC winemaker about ice wine is kinda like asking for alfredo sauce in Italy. They'll just kink their eyebrows and say, "That's not what we do here. Try something else." Ice wine is actually more prevalent in places like Ontario, where temperatures drop below freezing during baseball season. Western Canada makes wine like most of the US' West Coast, with pinot noirs, cab Francs, and petit verdot dominating the reds; chardonnays, rieslings, and gewürztraminers the whites. As with any wine region, some wines you'll like, and others you won't. But if you're not a connoisseur -- as the vast majority of wine tourists are not -- the wine here serves the purpose of your trip: trying small-production wines you'll likely never find again, then taking home some fantastic juice to impress your friends. The wineries have character that hasn't been compromised amid platoons of tourists. 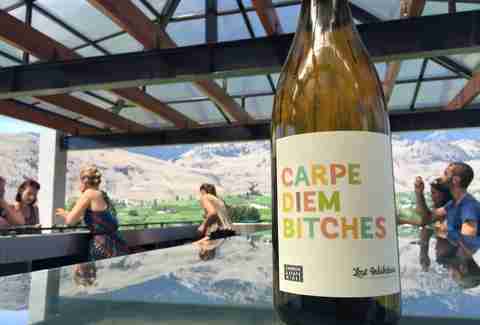 At Church and State, set low in the hills in the eastern valley, winemakers have created a line of wines called "Lost Inhibitions," complete with labels that say things like "Zero f*cks given" and "Friday is my second-favorite F-word." Down the road on the other side of the valley you'll find Rustico Farm & Cellars, a Western-themed spot in a historic bunkhouse that feels more like the waiting area for Big Thunder Mountain than any winery in California. But the best thing about the wineries here? They're inexpensive. A tasting can run as little as $3 (Canadian) for four samples. Like anything in life, you get what you pay for, so those samples aren't going to go much past a sip. But even at spots like stately Hester Creek or homey Maverick Estate -- which pour big tastes -- you'll rarely see a tasting over $10. And of course, a hop-on-hop-off shuttle takes you to all of these places. So you can enjoy all the wine you want without worrying about transportation. The valley's abundance of you-pick farms on Highway 97 gives a visitor the first inclination of the food ahead. The larger wineries all have restaurants, where chefs have relationships with the tiny local farms, and menus take advantage of the local produce. The area also sits smack between the Pacific Ocean and Canada's cattle country, meaning both the seafood and the beef are insanely fresh. And the restaurants all come with a view. The Sonora Room at Burrowing Owl Estate feels like eating in an old hunting lodge over a lush desert valley. And the corner table on the patio at Tinhorn Creek’s Mirodoro might be the best table in the region. 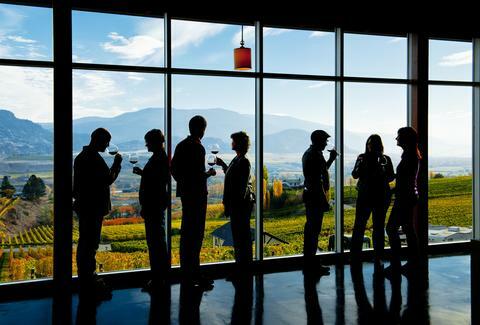 The winery sits in the middle of the two towns, halfway up one of the mountains, so one diner looks south at Lake Osoyoos, and the other looks north into the wineries of Oliver. Again, the kicker is the price. A three-course meal for two with wine and a world-class view will run you about $130 Canadian, roughly $100 US. And that's for the fancy places. The valley is also home to a fairly large Indian population, and if you're hankering for a curry to pair with your gewürztraminer, you can eat for cheap at Best of India or a few other great holes-in-the-wall. That big lake does more than form a centerpiece for your Instagram pictures. During summer it's packed with boaters, kayakers, and paddleboarders. And even for the not-so-active, the beach on the lakefront is a nice place to relax and let your wine buzz wear off. Or nurse your hangover. Either/or. It's a mountain region, so obviously there's plenty of biking, but the area is also home to three golf courses, including the 36-hole Osoyoos Golf Club. Or if you want to take a day off from wine tasting and enjoy the agriculture, Covert Farms in the northern end of the valley is a relaxing rustic farm with an in-house restaurant and acres of produce you can pick. They'll even take you out in their antique red pick-up truck and let you sip some sparkling wine in the middle of a vineyard, if you just can't go a day without wine. The Okanagan is the warmest part of Canada (relative, I know). That means it's a winter home for inter-Canadian snowbirds from the really cold parts of the country, who want milder climes without having to RV to Nevada. Those snowbirds rent their condos in the summer. And that abundance of supply, as anyone who took freshman-year economics can tell you, pushes down the prices for everything. Take the modern Watermark Beach Resort, a centerpiece hotel for the region with a giant swimming pool, pool bar, gourmet restaurant, and everything else you'll want when you're not turning your teeth purple. Here the two-bedroom units can be had for about $200 (US) per night. If you've got two couples that's 50 bucks each, or about what two wine tastings ran me in Napa. Even on the high end, the luxury, private, one-bedroom villas atop the Hester Creek winery aren't priced for celebrities either. With breakfast on your private patio overlooking the valley included, the price is about $300 (US) a night. Or about $20 more than that Holiday Inn Express I stayed at. Oh. But there's always a catch. 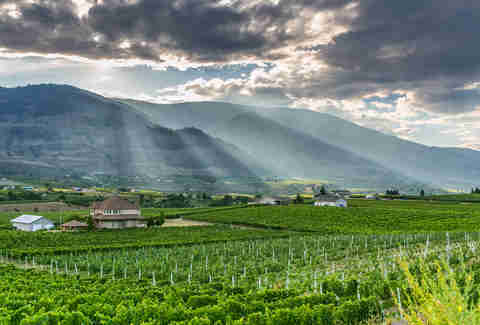 As wonderful, affordable, and delicious as the Okanagan Valley is, it's also not exactly right next to a major airport. Or any airport. The closest one is in Penticton, a fairly expensive regional airport about an hour away, accessible from Vancouver or Calgary. Slightly larger (but 90 minutes away) is Kelowna International Airport, cheaper and accessible from big airports in the Western United States. Tell you what, though, if you're up for an adventure, fly into Vancouver and drive. You're looking at a four-or five-hour journey over emerald mountains, into rough desert hills, along streams, down windy roads, and through green valleys. The road sometimes slims to just two lanes, and drivers might slow to do crazy stuff like bask in the scenery. But if you've got some time in the summer months, when the mountain roads are clear of snow, this is absolutely the way to do it. 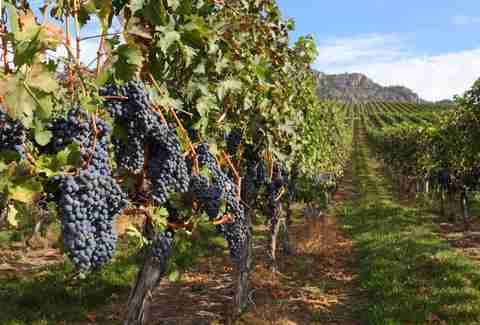 So yes, Canada might not be the first place you think of when considering a wine-tasting vacation. But if you're more into the quality of your experience than name recognition, it's a tough destination to beat. The wines are good, the food is fresh, the scenery is unbeatable, and it won't cost you a fortune. It might not be a connoisseur's first choice, as the wines here are good but not internationally known. But for most of us, we're just there to have fun. After the second winery, they all taste the same anyway. Matt Meltzer is a staff writer with Thrillist who was heartbroken that Canada doesn't offer passport stamps. Follow him on Instagram: @meltrez1.